See new poll on side. From Ecclesia de Eucharistia, from Cardinal Burke's book I am now reading. "This sacrifice [of Calvary] is so decisive for the salvation of the human race that Jesus Christ offered it and returned it to the Father only after he had left us a means of sharing in it as if we had been present there. Each member of the faithful can thus take part in it and inexhaustibly gain its fruits." Well, the computer is broken, I am having an asthma attack and I am trying to find a job, two which did not happen recently. This is what happens when God is stretching one to trust. I do trust. I am borrowing a computer today. Also, I have been talking to someone about the "m-people" in their family. One can guess who those are and why I may be "under attack". I praise God and smile and know that if one is left alone, one is not doing the right thing. Such is trusting in the Church Militant. Remember, we are all in enemy territory now. I share a concern with many good Catholics about the lack of teaching on the Ten Commandments. Too many Catholics believe that Christ did away with rules. Also, too many Catholics do not understand the concept of law in the Church. God revealed Himself to the Jewish People as we see in the Old Testament. The Ten Commandments are basically the natural law which God put on the hearts of all people in Creation and which men and women after the Fall, after the darkness of the intellect and concupiscence, had to revisit through Moses. Sadly, there are two generations which seem to think one can fudge on the Ten Commandments. Not so. The Ten Commandments are the basics, basic training not Ranger School. The Beatitudes come after obedience to the Ten Commandments. One must absolutely fulfill the basics and keep working at the basics. One must be absolutely orthodox concerning the Ten Commandments, the Laws of the Church and prayer. One must fast. One must seek out mortifications. The Church Militant never rests. Never. And, one cannot skip steps to holiness, one cannot slack off. In fact, Christ says that one has to find the narrow gate. Find it! I have to find another place locally to try and use the Net. I cannot access news sites, videos or Mp3s. Please bear with me. In the meantime, I shall share some books with you which I am reading at this time. One of the things which one learns from St. Paul, is, of course, that we all have different gifts. We are not all called to do the same jobs in the Kingdom of God. Those who are not spiritual, do not understand this and want everyone to do the same things. Some people are teachers, deacons, priests, nuns, sisters, moms, dads, mechanics, doctors, and so on. Some people are called to have special needs, either mental or physical. Some people are rich and some are poor. Some are middle class. Some are black, some white, some red, some yellow, as in the classic divisions of the races. What we are all called to be is to be saints. Few are actually saints. I have met some saints in my lifetime and they have all been young, under fifty. Most have been under forty. Some have been in their twenties. Saints are people who have allowed God to purify them, strip away the predominant fault, and have been filled with God's love. I know five in Ireland. I know several in England. I know several in America. I hear some Christians criticizing those who are not doing a certain job in the Church. As we are all called to work in different ways, there is no need for this discrimination or criticisms. I can think of saints who were called to very narrow social groups, saints like Faustina, or Therese, the Little Flower, or Pier Giorgio Frassati, who died because he was being ignored by his own family. Some saints have been called to a slightly larger grouping, like Cardinal Newman or Thomas More. Some saints have been called to international ministries, such as Bernard of Clairvaux or Catherine of Siena, or John Paul II. We all have something to do in the Church Militant. No job is too small and no job is too big. What is important is that in our small or large spheres, we make a difference. How do we do this? But choosing perfection and the road to perfection--that makes the difference. 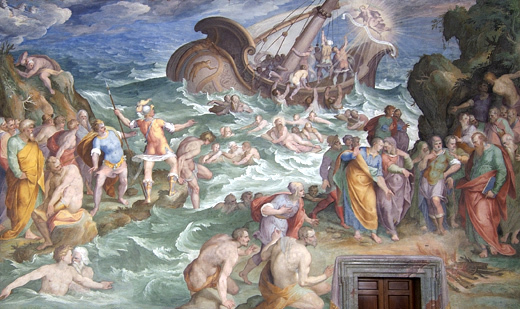 I was thinking of how St. Paul was shipwrecked on Malta. Because God allowed Paul to petition to be tried in Rome, as was his right, because God allowed a storm, all of Malta became Catholic at one point. A shipwreck was part of his ministry. Do you ever think that something which goes wrong, a tragedy or a failure may be part of a ministry? As those who read my blog know, for three full years plus, I have been moving about, staying with friends, as I have not had a permanent home. Some call me indigent, some homeless, some a missionary. God is in charge. Most people look down on me and now, I am almost getting use to this. The almost means I am still proud, and not humble. God is in charge. I have lost count of the jobs to which I have applied. I have lost track of the letters I have written to those in power for help. One thing I do know is that God uses every moment I give Him and I have given Him my entire life. The other day, one of my holy young friends said to me, "Maybe you are supposed to be moving around like this." I did not want to hear that. No, I did not. Many years ago, (1983), someone I love dearly said to me, "Your life does not make sense without God." St. John Paul II said something similar in his book, Sign of Contradiction. He said that man can only understand himself with reference to God. God is creative. He is Creativity. Perhaps in His Creativity, He calls some to be signs that materialism and consumerism are not "it". The Catholic, each Catholic, is called to be a sign of contradiction in the world. My state is merely extreme. 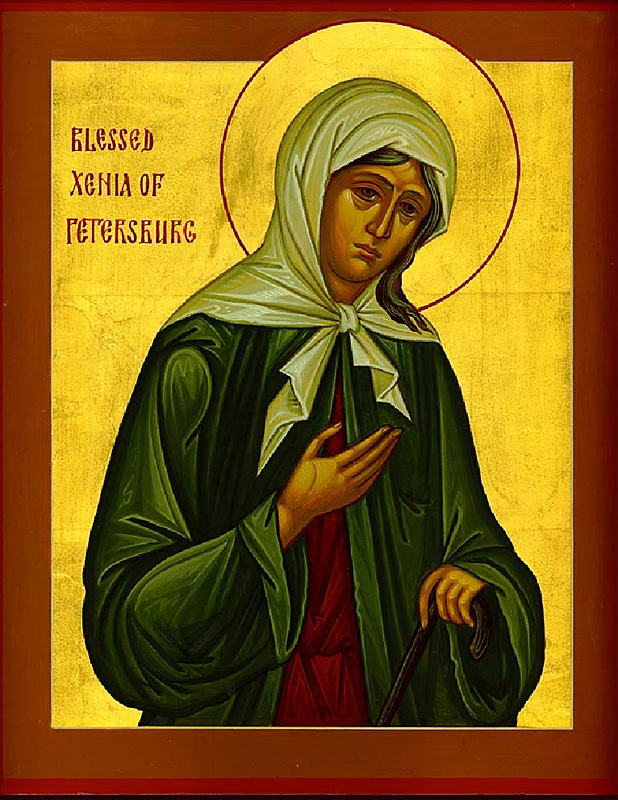 St. Xenia of St. Petersburg chose to be a Fool for Christ after the death of her husband. She chose poverty and constant pilgrimage. It was not thrust upon her. Therein lies her sanctity. If you need or want the following, pray to St. Xenia as she is patron of employment, marriage, the homeless, for fires, for missing children, and for a spouse. (It is interesting that my nickname given to me by my students long ago was Zena). Here are the hymns for her day, February 6th. In you, O mother was carefully preserved what is according to the image. But to care instead for the soul since it is immortal. Therefore, O Blessed Xenia, your spirit rejoices with the Angels. O Xenia, courageous and divinely wise. Rejoice, for after earthly wandering thou hast come to dwell in the Father’s house. You are now being satisfied at the Immortal Banquet. By the humility of the Cross, you received the power of God. We may be delivered from every evil thing. I am not sure why God has allowed my foolish life, but I have met wonderful people. I have met saints who help me be a better person. I have not had to live on the street or be in a homeless shelter because of excellent friends. But, I have had to move on. I only hope I make a difference, but then, that may not be part of this journey. I may never know this or anything else about my life which makes sense until I die. But, I do trust entirely in Divine Providence. I did not ask for this lifestyle, nor do I like it. In fact, I have hated my crazy life, which is a good sign. I have not hated myself, of course, but this peripatetic manner of living. People want me to do this or that, but I cannot make things happen. This is the great lie of America. One can try and try and still be poor. God is in charge. One works as hard as one can and then, one trusts in God. People get nervous, sometimes, around me, as they sense that they, too, could fall through the cracks, could be poor, could be displaced. But, those who trust in God do not get nervous. I am resigned to this now, and trust in God. 25 ... He that loveth his life shall lose it; and he that hateth his life in this world, keepeth it unto life eternal. I am a little homebody who loves simplicity, stability and security. I would love to be protected and special, to someone, but I am not. I am only special to God. In other words, I am a normal Christian woman. I have prayed for years for my own little place and some way to make a small income. This has not happened despite my best efforts and despite some who have tried to help me in publishing, for example. Earlier this year, I said that in years to come, because of anarchy and tyranny, there will be many displaced persons. Will you open your door to those people? Will you be so fearful that you could not open your house to a stranger? Every Friday, I pray the Litany of Humility. I have put it on the blog before... here it is again. And, here again, is a picture of Benedict Labre, one of my patrons. God is serious about this walk of humility. He is so serious, He allows us to be in situations which humble us. To be very poor in America is truly humbling. To be very poor among fellow educated people becomes humbling, as those cannot understand or face failure. To be very poor among people who judge poverty as a result of great sin is simply part of the deal. Only the Russians of old knew that the indigenous fool was chosen by God to remind them of their mortality. By the way, if someone wants to get me St. John Paul II's book, Sign of Contradiction, I would love to read the whole thing, and not merely excerpts. More posts on the same theme....somewhere, in a box in Silvis, I have an icon similar to this one of Basil of Moscow. I bought it a long time ago.